Run, don't walk, to the Arboretum's ever-popular Fall Plant Sale! Gardeners in the know, know this is the best time of the year for planting. You will find hundreds of varieties of plants that are well-suited to the central California Coast. Featured plants are from California, Australia, and South Africa. A list of plants for sale at this year's sale is available here (PDF); a compact 2 page plant list is also available. The list will be updated as more plants are added. Along with our popular succulent pumpkins, we will also offer a selection of garden worthy succulents and cacti including various species of Echeveria, Agave, Aloe, Sedum, Gasteria, Haworthia and Dudleya!" 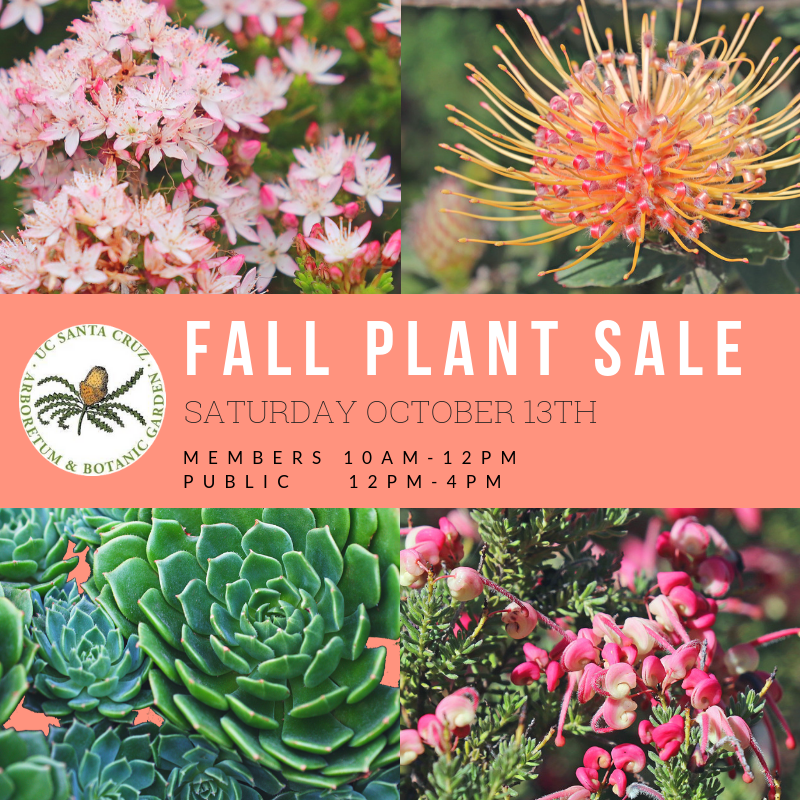 In partnership with the California Native Plant Society (CNPS), the sale offers high quality, regionally-friendly plants from both groups at great prices. *Presale for Arboretum & CNPS members – 10am-12pm. Come early for the best selection. Not yet a member of the Arboretum or CNPS and want to get in early? Join the Arboretum Friends online or at the entry on the day of the plant sale. Curators and knowledgeable volunteers on-site will help you choose extraordinary plants. "Valet Wheelbarrow Service" volunteers assist shoppers in transporting their purchased plants to the parking area. Come prepared, check out our plant sale tips! See map for sale location & traffic flow.